"Neo-Renaissance" redirects here. For the style of jewellery, see Holbeinesque jewellery. Renaissance Revival architecture (sometimes referred to as "Neo-Renaissance") is a group of 19th century architectural revival styles which were neither Greek Revival nor Gothic Revival but which instead drew inspiration from a wide range of classicizing Italian modes. Under the broad designation "Renaissance architecture" nineteenth-century architects and critics went beyond the architectural style which began in Florence and central Italy in the early 15th century as an expression of Humanism; they also included styles we would identify as Mannerist or Baroque. Self-applied style designations were rife in the mid- and later nineteenth century: "Neo-Renaissance" might be applied by contemporaries to structures that others called "Italianate", or when many French Baroque features are present (Second Empire). The divergent forms of Renaissance architecture in different parts of Europe, particularly in France and Italy, has added to the difficulty of defining and recognizing Neo-Renaissance architecture. A comparison between the breadth of its source material, such as the English Wollaton Hall, Italian Palazzo Pitti, the French Château de Chambord, and the Russian Palace of Facets—all deemed "Renaissance"—illustrates the variety of appearances the same architectural label can take. The origin of Renaissance architecture is generally accredited to Filippo Brunelleschi (1377–1446):243 Brunelleschi and his contemporaries wished to bring greater "order" to architecture, resulting in strong symmetry and careful proportion. The movement grew from scientific observations of nature, in particular human anatomy. Neo-Renaissance architecture is formed by not only the original Italian architecture but by the form in which Renaissance architecture developed in France during the 16th century. During the early years of the 16th century the French were involved in wars in northern Italy, bringing back to France not just the Renaissance art treasures as their war booty, but also stylistic ideas. In the Loire valley a wave of chateau building was carried out using traditional French Gothic styles but with ornament in the forms of pediments, arcades, shallow pilasters and entablatures from the Italian Renaissance. In England the Renaissance tended to manifest itself in large square tall houses such as Longleat House. Often these buildings had symmetrical towers which hint at the evolution from medieval fortified architecture. This is particularly evident at Hatfield House built between 1607 and 1611, where medieval towers jostle with a large Italian cupola. This is why so many buildings of the early English Neo-Renaissance style often have more of a "castle air" than their European contemporaries, which can add again to the confusion with the Gothic revival style. When in the 19th century Renaissance style architecture came into vogue, it often materialized not just in its original form according to geography, but as a hybrid of all its earlier forms according to the whims of architects and patrons rather than geography and culture. If this were not confusing enough, the new Neo-Renaissance then frequently borrowed architectural elements from the succeeding Mannerist period, and in many cases the even later Baroque period. Mannerism and Baroque being two very opposing styles of architecture. Mannerism was exemplified by the Palazzo del Te and Baroque by the Wurzburg Residenz. Thus Italian, French and Flemish Renaissance coupled with the amount of borrowing from these later periods can cause great difficulty and argument in correctly identifying various forms of 19th-century architecture. Differentiating some forms of French Neo-Renaissance buildings from those of the Gothic revival can at times be especially tricky, as both styles were simultaneously popular during the 19th century. John Ruskin's panegyrics to architectural wonders of Venice and Florence contributed to shifting "the attention of scholars and designers, with their awareness heightened by debate and restoration work" from Late Neoclassicism and Gothic Revival to the Italian Renaissance. As a consequence, a self-consciously "Neo-Renaissance" manner first began to appear circa 1840. By 1890 this movement was already in decline. The Hague's Peace Palace completed in 1913, in a heavy French Neo-Renaissance manner was one of the last notable buildings in this style. Charles Barry introduced the Neo-Renaissance to England with his design of the Travellers Club, Pall Mall (1829–1832). Other early but typical, domestic examples of the Neo-Renaissance include Mentmore Towers and the Château de Ferrières, both designed in the 1850s by Joseph Paxton for members of the Rothschild banking family. The style is characterized by original Renaissance motifs, taken from such Quattrocento architects as Alberti. These motifs included rusticated masonry and quoins, windows framed by architraves and doors crowned by pediments and entablatures. If a building were of several floors, the uppermost floor usually had small square windows representing the minor mezzanine floor of the original Renaissance designs. However, the Neo-renaissance style later came to incorporate Romanesque and Baroque features not found in the original Renaissance architecture which was often more severe in its design. Like all architectural styles, the Neo-Renaissance did not appear overnight fully formed but evolved slowly. One of the very first signs of its emergence was the Würzburg Women's Prison, which was erected in 1809 designed by Peter Speeth. It included a heavily rusticated ground floor, alleviated by one semicircular arch, with a curious Egyptian style miniature portico above, high above this were a sequence of six tall arched windows and above these just beneath the slightly projecting roof were the small windows of the upper floor. This building foreshadows similar effects in the work of the American architect Henry Hobson Richardson whose work in the Neo-Renaissance style was popular in the USA during the 1880s. Richardson's style at the end or the revival era was a severe mix of both Romanesque and Renaissance features. :300–318 This was exemplified by his "Marshall Field Warehouse" in Chicago (completed in 1887, now demolished). However, while the beginning of Neo-Renaissance period can be defined by its simplicity and severity, what came between was far more ornate in its design. This period can be defined by some of the great opera houses of Europe, such as Gottfried Semper's Burgtheater in Vienna, and his Opera house in Dresden. This ornate form of the Neo-Renaissance, originating from France,:311 is sometimes known as the "Second Empire" style, by now it also incorporated some Baroque elements. By 1875 it had become the accepted style in Europe for all public and bureaucratic buildings.:p. 311; caption 938 In England, where Sir George Gilbert Scott designed the London Foreign Office in this style between 1860 and 1875, it also incorporated certain Palladian features. Starting with the orangery of Sanssouci (1851), "the Neo-Renaissance became the obligatory style for university and public buildings, for banks and financial institutions, and for the urban villas" in Germany. Among the most accomplished examples of the style were Villa Meyer in Dresden, Villa Haas in Hesse, Palais Borsig in Berlin, Villa Meissner in Leipzig; the German version of Neo-Renaissance culminated in such turgid projects as the Town Hall in Hamburg (1886–1897) and the Reichstag in Berlin (completed in 1894). In Austria, it was pioneered by such illustrious names as Rudolf Eitelberger, the founder of the Viennese College of Arts and Crafts (today the University of Applied Arts Vienna). 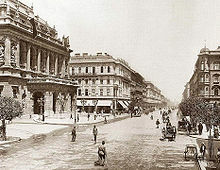 The style found particular favour in Vienna, where whole streets and blocks were built in the so-called Neo-Renaissance style, in reality, a classicizing conglomeration of elements liberally borrowed from different historical periods. Neo-Renaissance was also the favourite style in Kingdom of Hungary in the 1870s and 1880s. In the fast-growing capital, Budapest many monumental public buildings were built in Neo-Renaissance style like Saint Stephen's Basilica and the Hungarian State Opera House. Andrássy Avenue is an outstanding ensemble of Neo-Renaissance townhouses from the last decades of the 19th century. The most famous Hungarian architect of the age, Miklós Ybl preferred Neo-Renaissance in his works. The style was further elaborated by architects of the Vladimir Palace (1867–1872) and culminated in the Stieglitz Museum (1885–1896). In Moscow, the Neo-Renaissance was less prevalent than in the Northern capital, although interiors of the neo-Muscovite City Duma (1890–1892) were executed with emphasis on Florentine and Venetian décor. While the Neo-Renaissance is associated primarily with secular buildings, Princes Yusupov commissioned the interior of their palace church (1909–1916) near Moscow to be decorated in strict imitation of the 16th-century Venetian churches. The style spread to North America, where it became a favourite domestic architectural style of the wealthiest Americans. The Breakers in Newport, Rhode Island, was a residence of the Vanderbilt family designed by Richard Morris Hunt in 1892; it and contemporaneous Gilded Age mansions exemplify the ambitions of wealthy Americans in equaling and surpassing the ostentatious lifestyles of European aristocrats. During the latter half of the 19th century 5th Avenue in New York City was lined with "Renaissance" French chateaux and Italian palazzi, all designed in Neo-Renaissance styles. Most of these have since been demolished. Paris Hôtel de Ville completed circa 1880 in an unequivocal French Neo-Renaissance style. One of the most widely copied features of Renaissance architecture were the great staircases from the chateaux of Blois and Chambord. Blois had been the favourite residence of the French Kings throughout the renaissance. The Francis I wing, completed in 1524, of which the staircase is an integral part was one of the earliest examples of French Renaissance. French renaissance architecture was a combination of the earlier Gothic style coupled with a strong Italian influence represented by arches, arcades, balustrading and, in general, a more flowing line of design than had been apparent in the earlier Gothic. The Chateau de Blois's triumphal staircase was imitated almost from the moment of its completion, and was certainly the predecessor of the "double staircase" (sometimes attributed to Leonardo da Vinci) at the Château de Chambord just a few years later. This Renaissance Revival doorway illustrates a Gothic influence on French Renaissance design. A basket-handle portal is surmounted by a floral ogee hood moulding. Gothic influences on both period and revived Renaissance architecture are readily apparent, first as much building occurred during the period of transition from the Gothic to the Renaissance style; and also as Renaissance−era design took the form of the addition of Renaissance ornamentation to Gothic−era buildings thus creating an accretion of details from disparate sources. Architects who designed in the Renaissance Revival style usually avoided any references to Gothic Revival architecture, drawing instead on a variety of other classically based styles. However, there are exceptions and occasionally the two distinct styles are mixed. The sub-variety of Gothic design most frequently employed is floral Venetian Gothic, as seen in the Doge's Palace courtyard, built in the 1480s. The staircase at the Warsaw University of Technology, with strong Baroque Revival influences. A common Baroque feature introduced into the Renaissance Revival styles was the "imperial staircase" (a single straight flight dividing into two separate flights). The staircase at Mentmore Towers designed by Joseph Paxton, and the one at the Warsaw University of Technology designed by Bronisław Rogóyski and Stefan Szyller (late 19th century), both rise from pastiches of true Renaissance courtyards. Both staircases seem more akin to Balthasar Neumann's great Baroque staircase at the Würzburg Residenz than anything found in a true Renaissance Palazzo. The apparent Baroque style staircase at Mentmore is not without a Renaissance influence, its first flight is similar to "The staircase of the Giants" rises from the Doge's Palace Courtyard, designed when the Venetian Gothic was being uncomfortably merged with Renaissance style. Similarly to that at Mentmore, the Staircase of the Giant's terminates on to an arcaded loggia. Perhaps not ironically the Hall and Staircase at Mentmore were designed by Paxton to display furniture formerly housed in the Doge's Palace. Paris is home to many historicist buildings that partake equally from Renaissance and Baroque source material, such as the Opera Garnier. However, the Parisian Hôtel de Ville faithfully replicates the true French Renaissance style, complete with the steeply pitched roofs and towers, as it was a reconstruction, completed circa 1880, of the previous Hôtel de Ville. In the British Raj in 1880, the façades of the 1777 Writers' building in Kolkata were redesigned in the Renaissance Revival style then popular in colonial India, though this version was remarkable in its unique design. Loggias of Serlian arches deceptively form an almost Indian appearance, yet they sit beneath a Mansard roof. In what at first glance appears an Indian building, on closer examination shows a Historicist example of Classical Palladianism combined with the French Renaissance, a uniquely distinctive interpretation of the Renaissance Revival style. True Renaissance: The Villa Farnese: the curved staircase, tall segmented windows, and marble balustrading were all features frequently reproduced in the 19th century revival. Provincial Neo-Renaissance English style: the NatWest Bank at Leighton Buzzard, Bedfordshire, England is an example of the manner in which Neo-Renaissance architecture evolved among lesser architects in more modest surroundings as it gained in popularity. By the beginning of the 20th century Neo-Renaissance was a commonplace sight on the main streets of thousands of towns, large and small around, the world. In southern Europe the Neo-Renaissance style began to fall from favour circa 1900. However, it was still extensively practiced in the 1910s in Saint Petersburg and Buenos Aires by such architects as Leon Benois, Marian Peretyatkovich, or Francisco Tamburini (picture). In England it was so common that today one finds "Renaissance Italian Palazzi" serving as banks or municipal buildings in the centres of even the smallest towns. It has been said "It is a well-known fact that the nineteenth century had no art style of its own." While to an extent this may be true, the same could be said of most eras until the early 20th century, the Neo-Renaissance in the hands of provincial architects did develop into a style not always instantly recognisable as a derivative of the Renaissance. In this less obvious guise the Neo-Renaissance was to provide an important undercurrent in totalitarian architecture of various countries, notably in Stalinist architecture of the Soviet Union, as seen in some pavilions of the All-Soviet Exhibition Centre. Neo-Renaissance Russian style: a little recorded, Neo-Renaissance building showing Baroque and Rococo influences in Yaroslavl, Russia. Neo-Renaissance architecture, because of its diversity, is perhaps the only style of architecture to have existed in so many forms, yet still common to so many countries. Gottfried Semper's Dresden Semper Opera House of 1870, incorporating both Baroque and Renaissance architectural features. ^ "Wollaton Hall". Greatbuildings.com. Retrieved 11 June 2011. ^ a b c d Copplestone, Trewin (1963). World Architecture. Hamlyn. ^ Rosanna Pavoni. Reviving the Renaissance: The Use and Abuse of the Past in Nineteenth-Century Italian Art. Cambridge University Press, 1997. ISBN 0-521-48151-1. Page 73. ^ The Cambridge Companion to Modern German Culture. Cambridge University Press, 1999. ISBN 0-521-56870-6. Page 283. ^ a b Julie A. Buckler. Mapping St. Petersburg: Imperial Text and Cityshape. Princeton University Press, 2004. ISBN 0-691-11349-1. ^ "Chateau de Blois". Castles.org. Retrieved 11 June 2011. ^ "Hôtel de Ville". Aviewoncities.com. Retrieved 11 June 2011. ^ a b Dal Lago, Adalbert (1966). Ville Antiche. Milan: Fratelli Fabbri. ^ Lessenich, Rolf P. "Ideals Versus Realities: Nineteenth-Century Decadent Identity and the Renaissance". 2004-01. Accessed 10 November 2013.